Inscriptions are a very special segment of finds. All details of their content and the names often mentioned in these inscriptions are usually discussed mostly by epigraphic specialists. 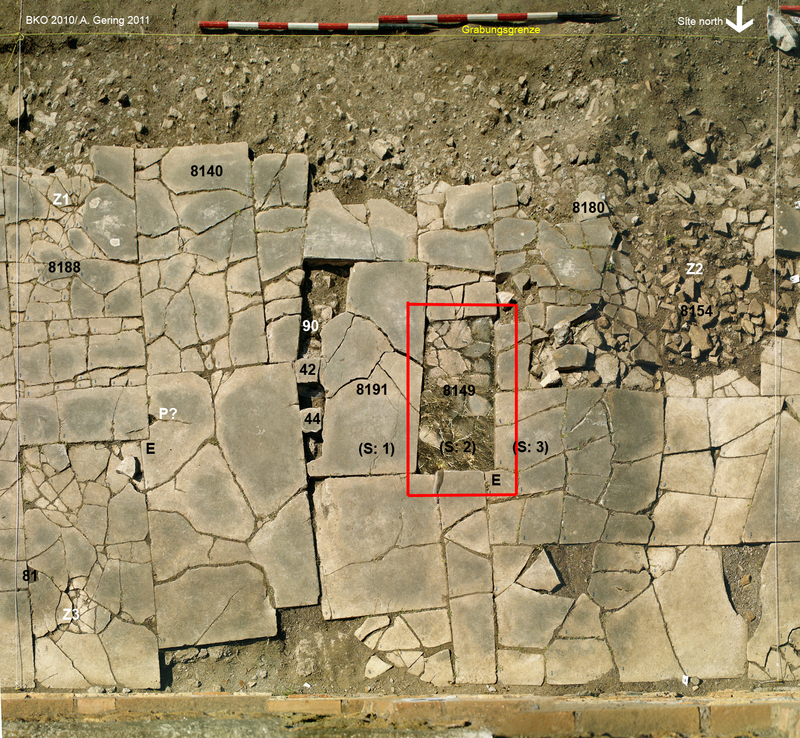 However, their find-context is a very important fact for the archaeological discussion. 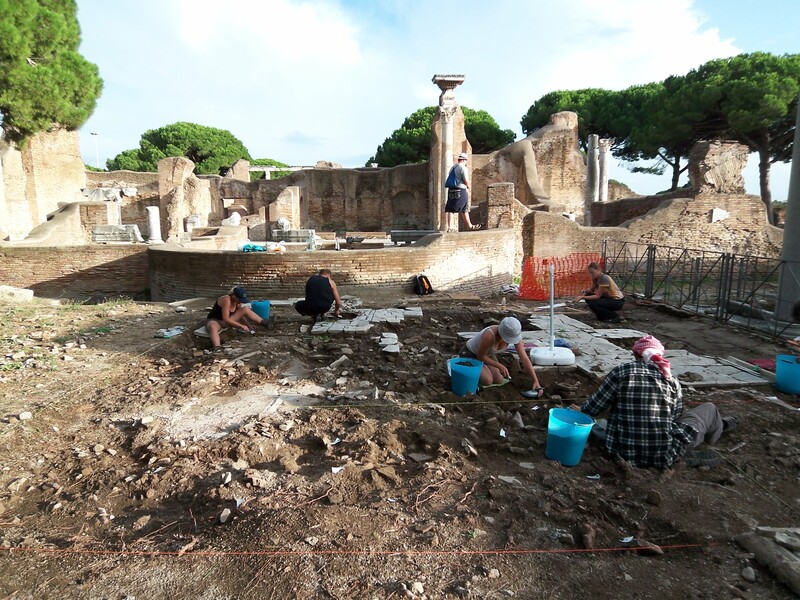 Many fragments of inscriptions were found, which had been reused as pavement-slabs in the Forum, in almost all adjoining buildings and the other plazas of Ostia too. 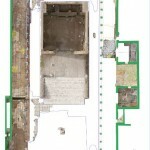 Their context is significant for the archaeological interpretation in two ways: firstly, we can date and reconstruct the original monuments in their antique setting by the informations delivered by the inscriptions, and secondly, the date of their reuse allows us to define which monuments or buildings were already out of function or dismantled at the time of their secondary use (compare the section “Spolia-Surveys“) . 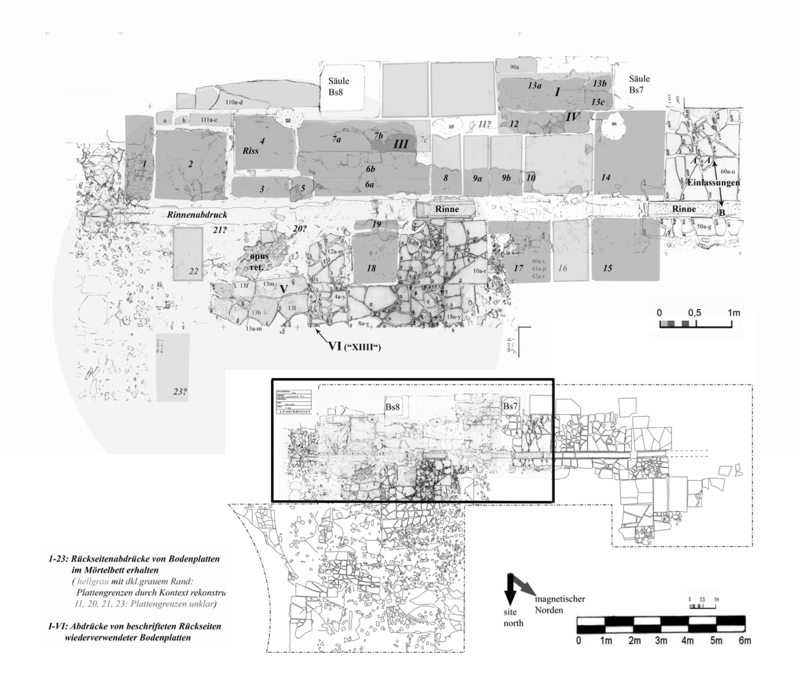 Five types of inscriptions were found in the excavcations: 1.) 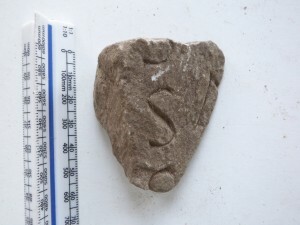 many small fragments of inscriptions (partly from tombs? ), mostly single letters, 2.) some more complete or full inscriptions with representative/monumental character, 3.) 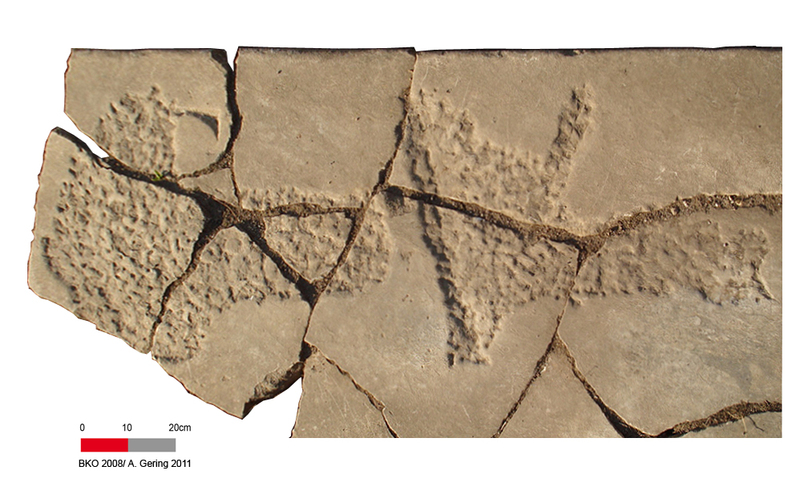 mortar-imprints of lost inscriptions (see pictures below. 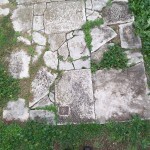 Compare www.lateantiqueostia.wordpress.com), 4.) erased letters or inscriptions, and 5.) everyday inscriptions of non-professional craftsmen, so called graffitti. In 2010 a monumental inscription, consisting of many fragments, appeared during our archeological fine-cleaning of the surfaces of the Forum (see pictures below: in the red frame). The inscriptions mentioned in this section were first published in A. Gering, Römische Mitteilungen 2011 (see “Project Publications 2011“). 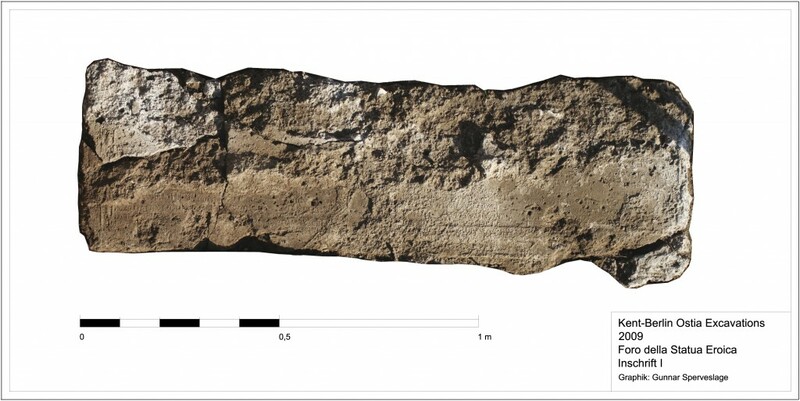 Immediately after the laserscanning of the backside of all fragments, one first attempt was made to put the inscription together, with some minor mistakes in the first line. 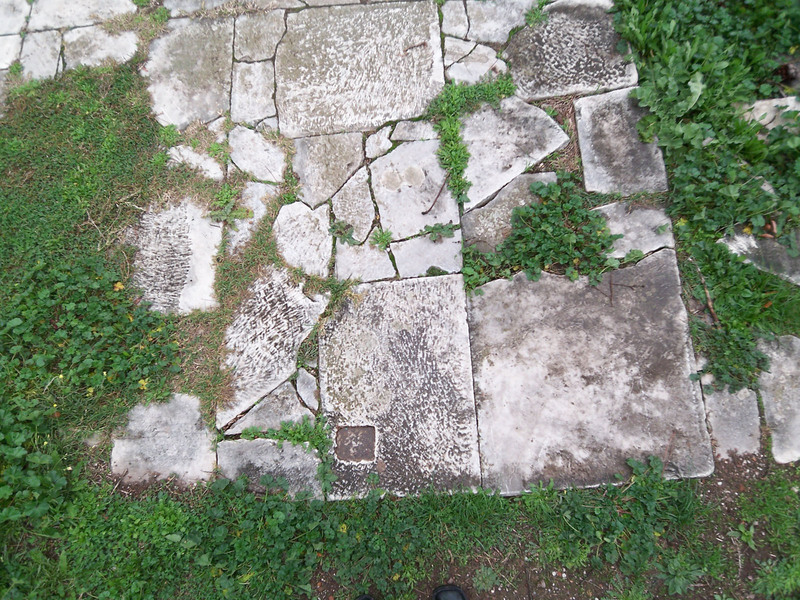 … and on the other hand to reconstruct the former dimensions of the inscription and all traces of its later reuse as a pavement-slab put upside down in the concrete. An Aulus Egrilius Auli Filius dedicated a monument to a NUMEN, financed with his own money based on an enactment of the city-council, the decuriones. The ornament is a fine example of how a stilistic dating to the late 1st century AD can be verified by the known dates of the career of the dedicator himself. 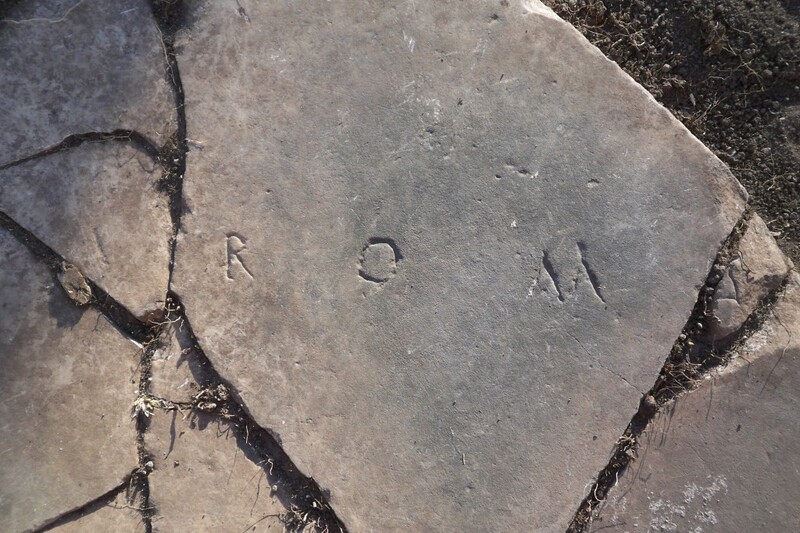 A more fragmented, but still monumental inscription (according to the letter size), was documented in 2012 near the central apse of the portico MFP. 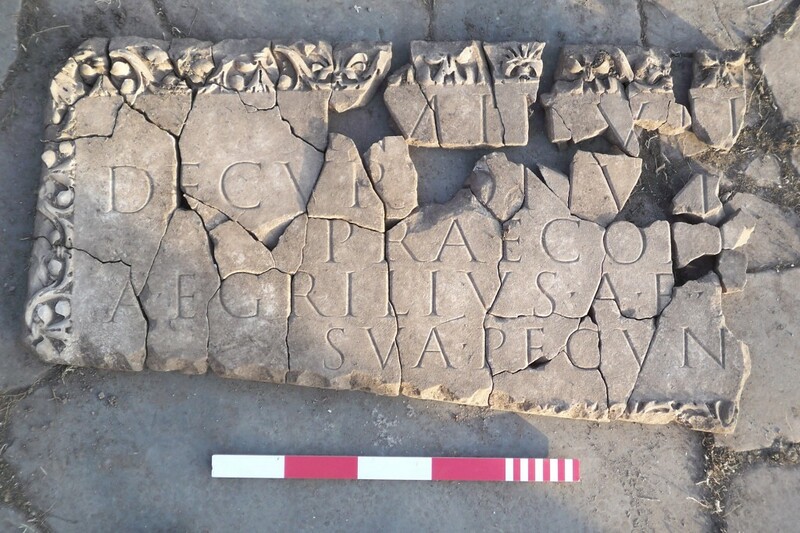 Maybe this fragment fits to a more complete inscription found in 1924 inside the apse according to the GdS (Giornale degli Scavi). 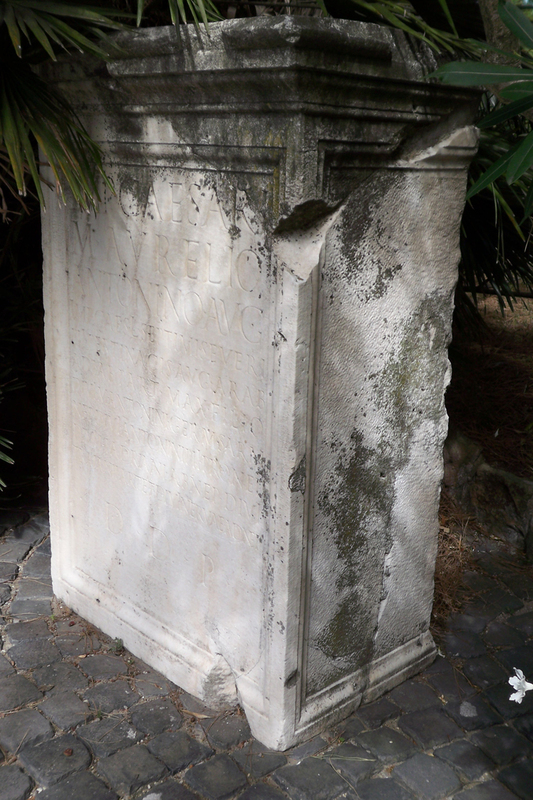 In 2007, an already known monument with a find-number was re-cleaned in the cistern of FSE. 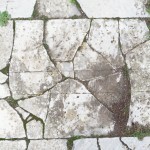 In the picture below, a large piece (a cast) embedded in modern mortar is visible. This cast imitates the shape of a large spolia, which originally was found here in the 1920’ies and was replaced later by the cast. The removed original was placed in front of the museum (see second picture below). 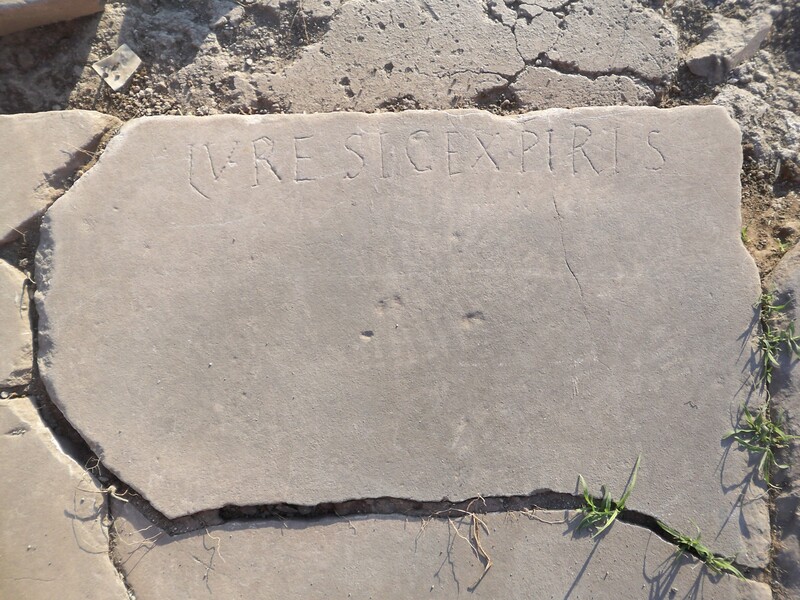 The spolia-piece contained an inscription, which faced down and could only be read after the spolia was removed in the 1960’ies. 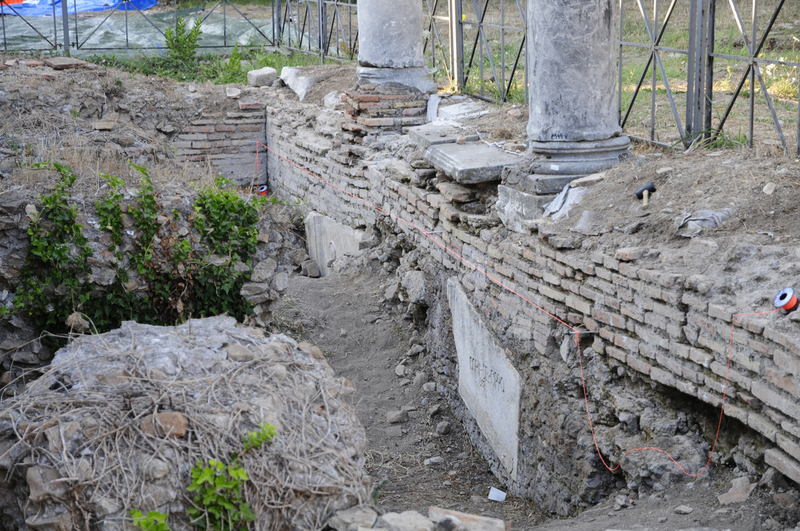 Members of our team continued in 2009 the de-vegetation in a northern direction towards the end of the cistern while the team of the cooperating University of Kent started to measure and draw the (partly still original) wall above the spolia-copy. Lena, Axel and Gunnar found some marble-surface originally covered by a large pile of debris (compare third picture above for the situation in 2007). 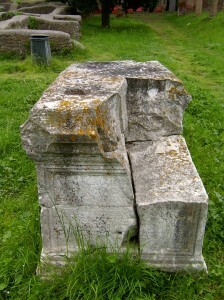 After cleaning the debris, the side of a decorated socle appeared. 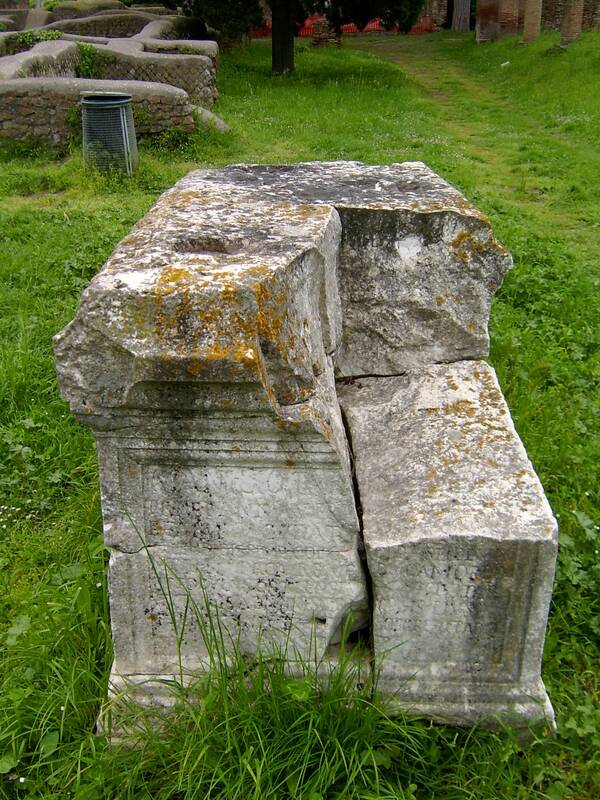 Did the old excavators miss a similar statue-socle as the spolia found in the 1920’ies? 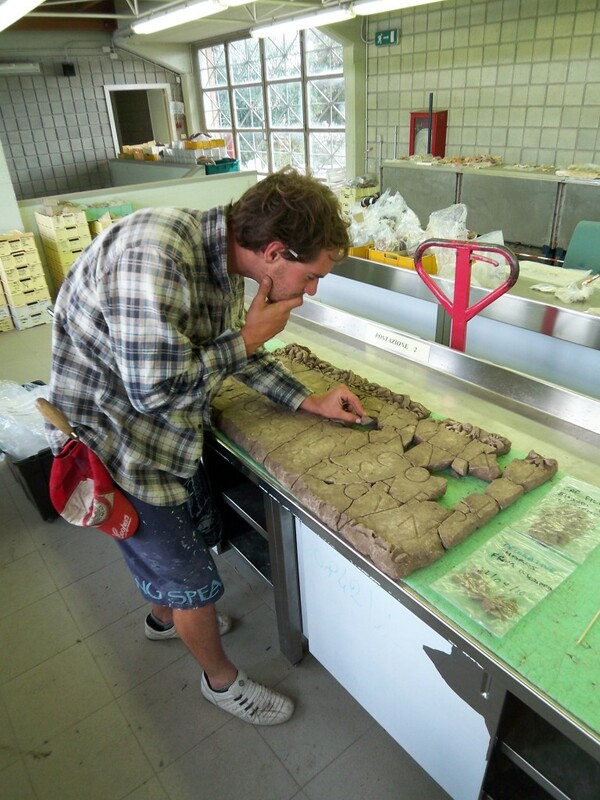 Initially the discovery seemed rather disappointing, because after removing some dust a modern find-number appeared. 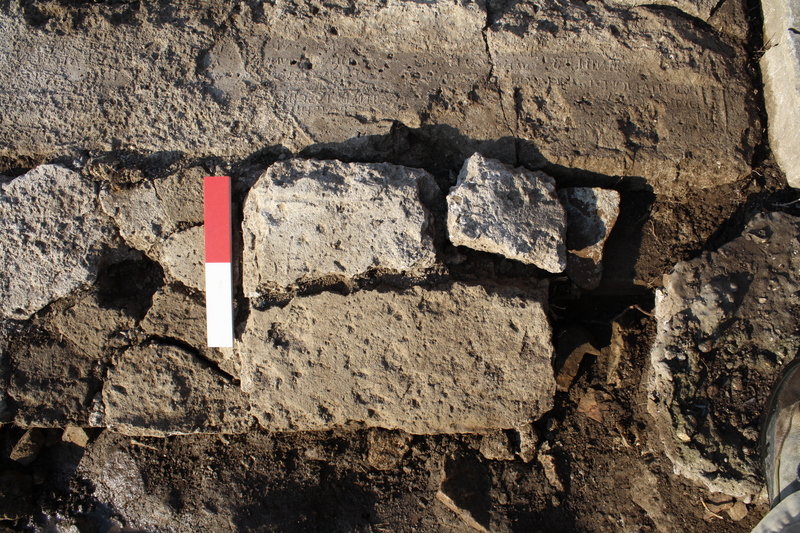 However, according to stratigraphical observations of Lena, it could be verified that the lower part of this marble block was embedded in situ in a layer of a dense filling with ceramics and antique mortar, in contrast to the cast mentioned above which was embedded in modern mortar. So it seems quite unlikely that the excavators of the 1920’ies were able to see the whole block. The former front-side was put upside down. The round cup (patera) on the side (see picture below) was a sufficient evidence to believe that this had been an altar and the original front-side probably contained an inscription. 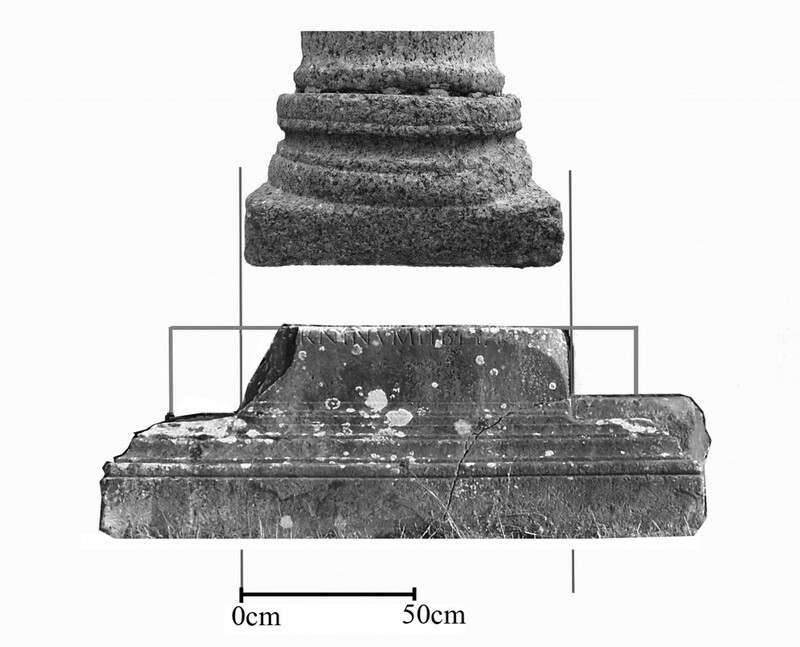 Unfortunately the removal of the whole altar with the possible inscription was impossible due to the column standing above it. 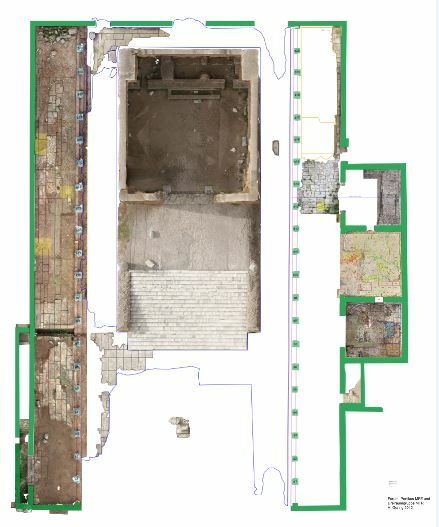 So it was decided to remove just – as minimal-invasive as possible – a little ‘corridor’ of the antique fill to make photos, which could have been merged afterwards (see pictures further below). To our surprise the letters were extremely well-preserved, even though they had been executed in an improvised manner (see picture below). 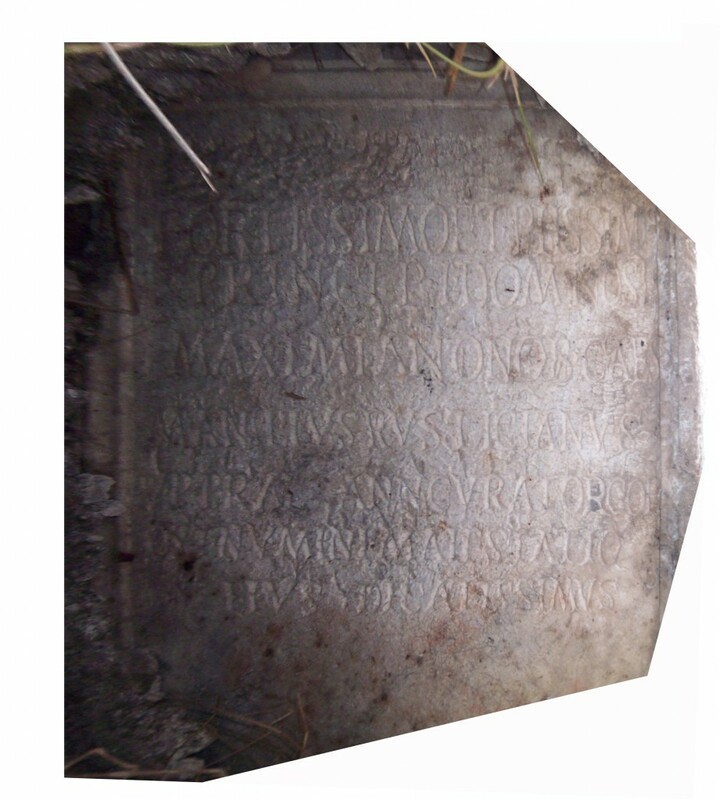 The inscription provides an excellent dating-evidence due to the fourth line of the partly erased inscription, which mentions MAXIMIANUS as PRINCEPS and CAESAR (see pictures above and below). 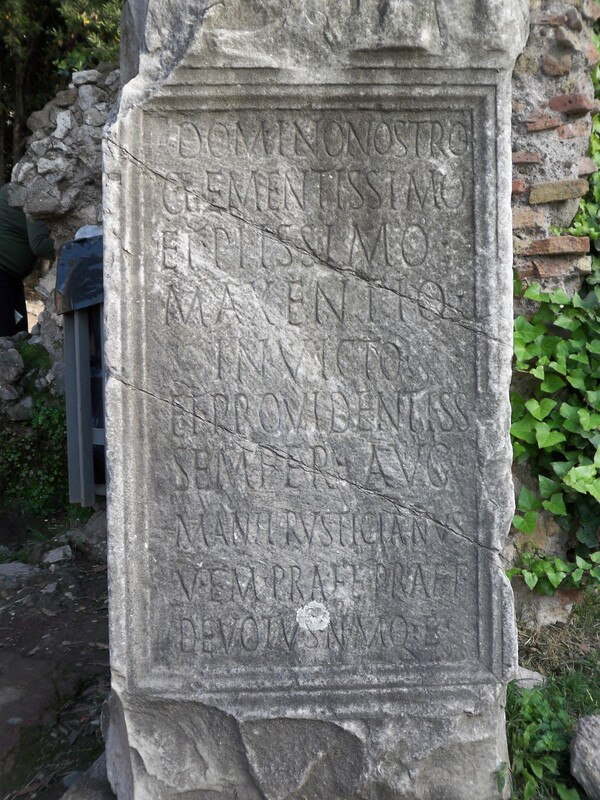 The inscription is therefore dated to the year 285 AD. It was obviously partly erased when Maximian and his praetorian prefect Manilius Rusticianus lost their significance in Constantinian times. 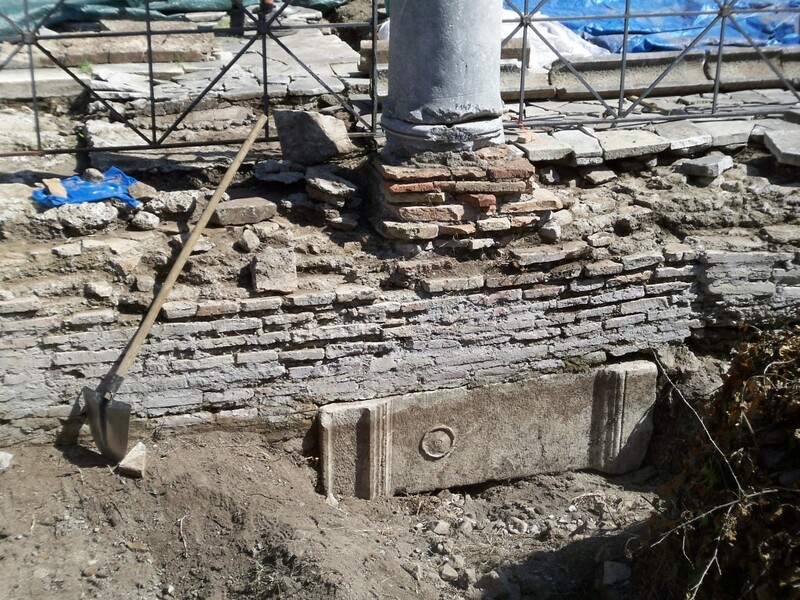 After this, the monument could have been reused to serve as a solid base inside the stylobat-walls of the late antique portico of FSE. 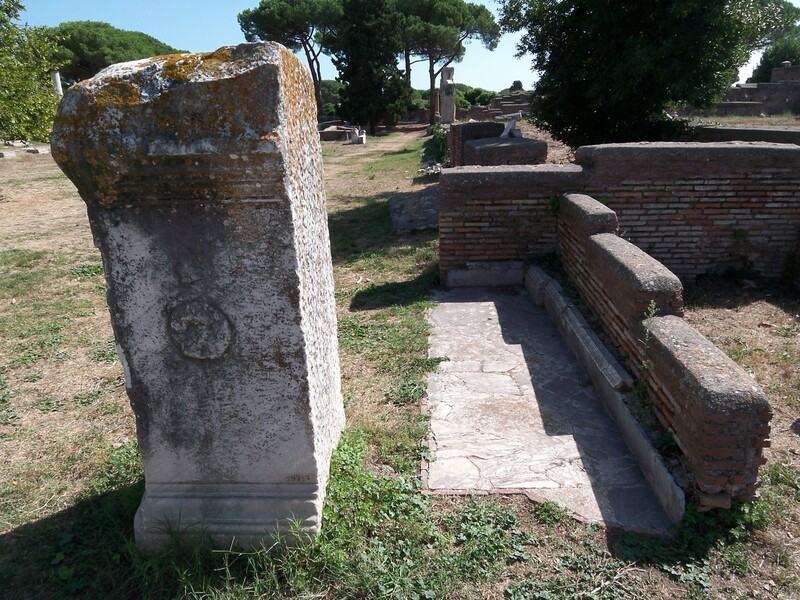 The same Man(i)lius Rusticianus is known from inscriptions of maxentian times from the Forum Romanum in Rome (see below left), the Main Forum of Ostia (below right) and some other places in Ostia, where the elite under Maxentius had invested in renovations. Some of these inscriptions were partly reworked from constantine times onwards, when this elite, Manlius and Ostia fell in a certain discredit. Another inscription provides an extraordinarily precise historic background by mentioning some officers of the year 242 AD. This inscription on an altar was known since the excavations in 1913, but this altar-fragment, reworked for a late-antique architrave, was – as usual in these days – never recorded in its context and secondary use (see picture below). The whole set of architraves can be dated due to rather vague stylistic reasons to a ‘later phase’ than the 2nd century. Due to the inscription, which would not have been immediately reused after 242, this suggestion of a ‘later phase’ can be verified without any doubt. 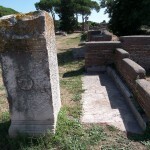 The unique architrave, which matched exactly to the length of the entrance to the “Foro della Statua Eroica” (FSE), probably the main market (macellum) of late antique Ostia, was created from reused architectural elements at the same time with not worked stones in the late third, fourth or early fifth centuries. 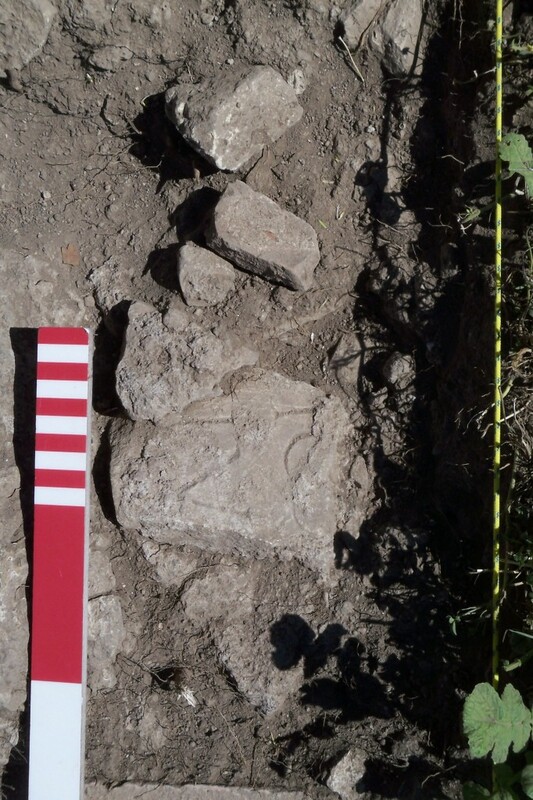 Due to a series of postholes, it is verified that it had been reused at least until the last re-erection of the facade in the late fifth century (for further details see section: “Large Finds“). Another inscription was reused as a support for a column-basis of the latest recorded rebuilding-phase of the entrance to FSE. 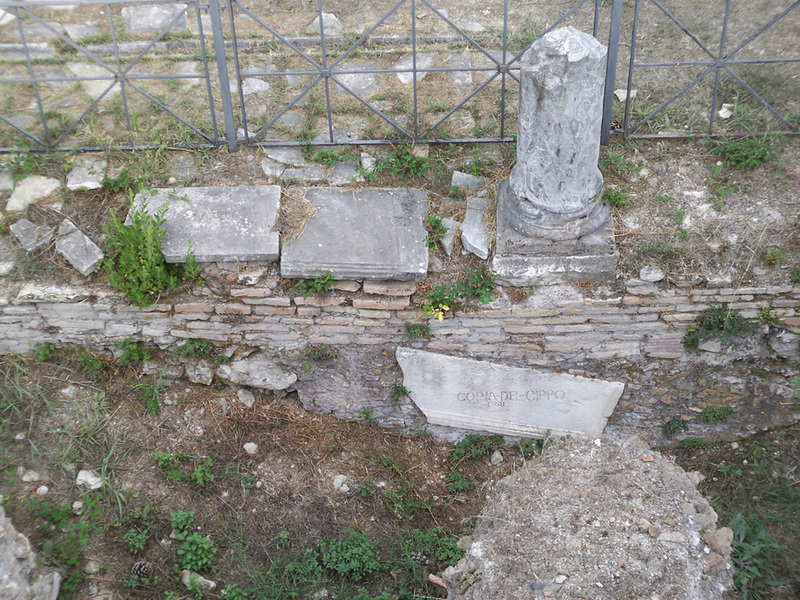 It obviously served as a former statue base, probably taken from the Forum when this was cleaned after one of the collapse-catastrophes of the fifth century. 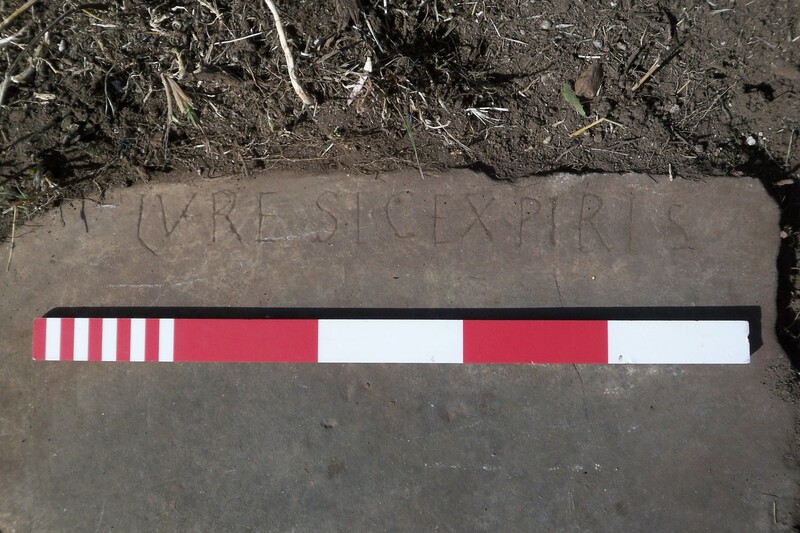 A third category allows us to experience many surprising insights into the practise of late antique spoliation: the mortar-imprints of lost inscriptions. To be able to read these they had to be reversed of course. An interesting detail is the framing of the inscription in the picture below: its fragmentation clearly demonstrates that it was already broken before it had been embedded in the mortar. 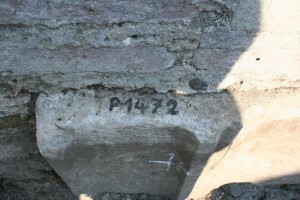 That is an evidence of a secondary reuse of this inscription, when the level of the pavement was raised after a collapse-catastrophe. A fourth category regards erased inscriptions, which were embedded in the pavement with their letters upwards, so they were still visible. 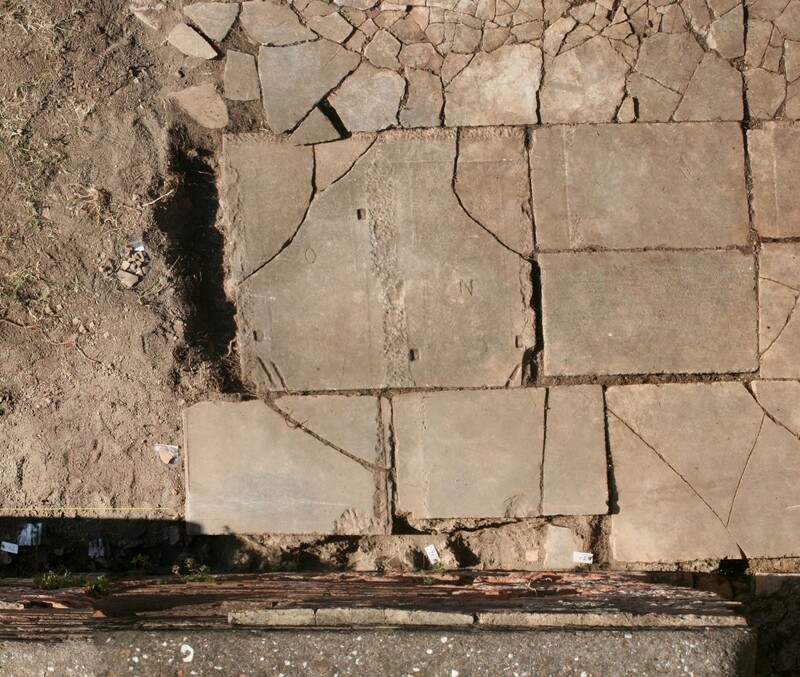 There is no convincing explanation so far why Roman builders did not reuse these slabs upside down, like they did with the majority of reused slabs in Ostia. 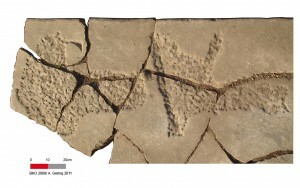 The later chisel marks themselves show no clear pattern, but could have been intentionally left visible for an unknown reason. The former letters T and possibly V were maybe part of the widespread word’s ending “TVS” and show by their size of more than 20 cm that they originally came from a monumental primary context like some temple or public building. 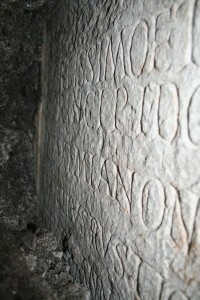 Graffitti is another subtype of common inscriptions found in antique cities. Due to its context, the graffitti on the picture below has to be a late antique inscription: the irregularly shaped slab is based on a secondary layer of mortar which cannot be dated before the middle of the 5th century. 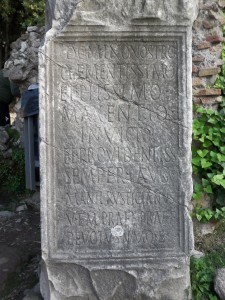 The inscription respects the slab-size and dimensions perfectly. 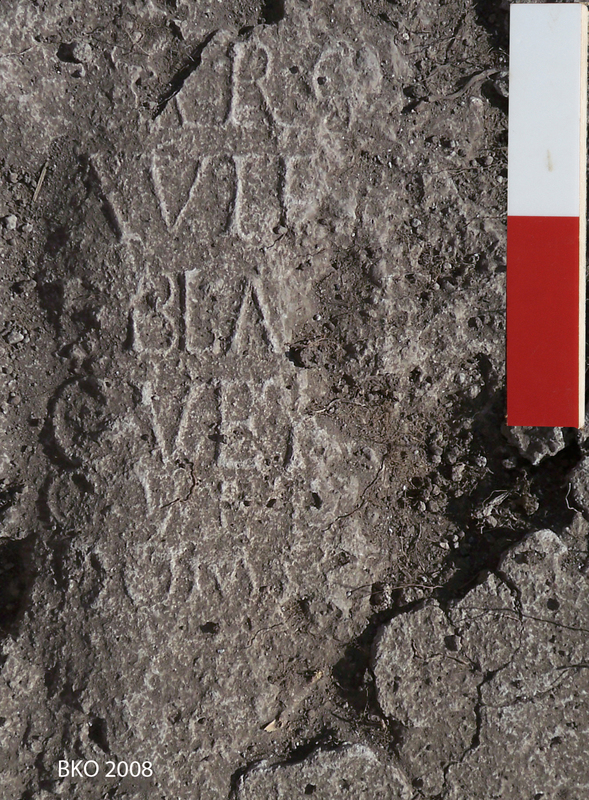 Lena Kaumanns, our epigraphist of 2010, delivered us with several possible translations of this inscription. The inscription allows some interesting assumptions regarding mentality when we read of a certain LURE, who was obviously a disliked person, which deserved to die or someone, who died justified (JURE). In the latter case our writer would not have had too much experience in writing an L or J. This could be confirmed by the writing-mistake in one of the following letters (R) and the variations of the dimension and orientation of the other letters. But still, someone would have needed to sit at least half an hour in the middle of the Forum’s portico without beeing disturbed (for example by former friends of LURE?) 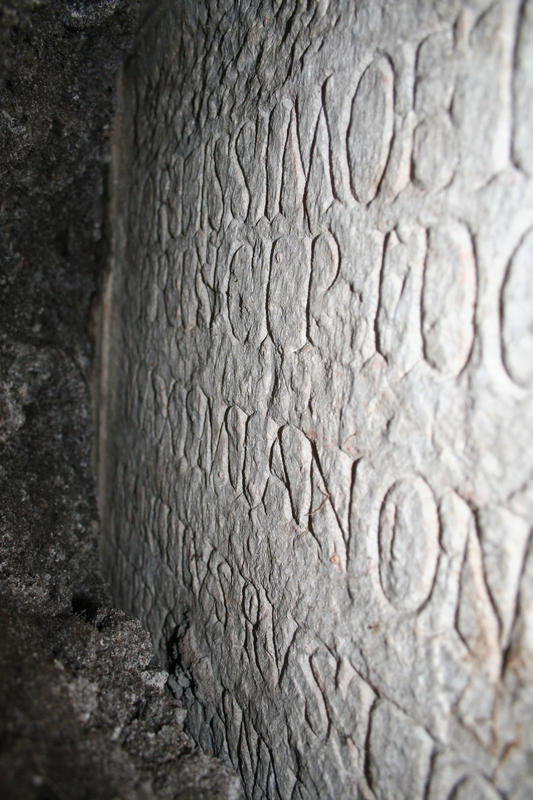 to create such an inscription with an improvised chisel-instrument that had been used here. Another graffitti had a very surprising content: Embedded in an undisturbed context of a slab, we read: A (.) ROMA. When the letters appeared first in 2010, a hypothesis was brought up by an AS Roma-fan, who suggested that we had found the oldest evidence for the city’s most important football club. Beside the possible relevance of this theory for future funding, this can esaily be falsified of course: The distance between the letters is roughly the same, thus there is no sufficient space for an extra S in between A and ROMA. Some other ideas were brought up to explain the numbers written on some of the slabs in FSE. 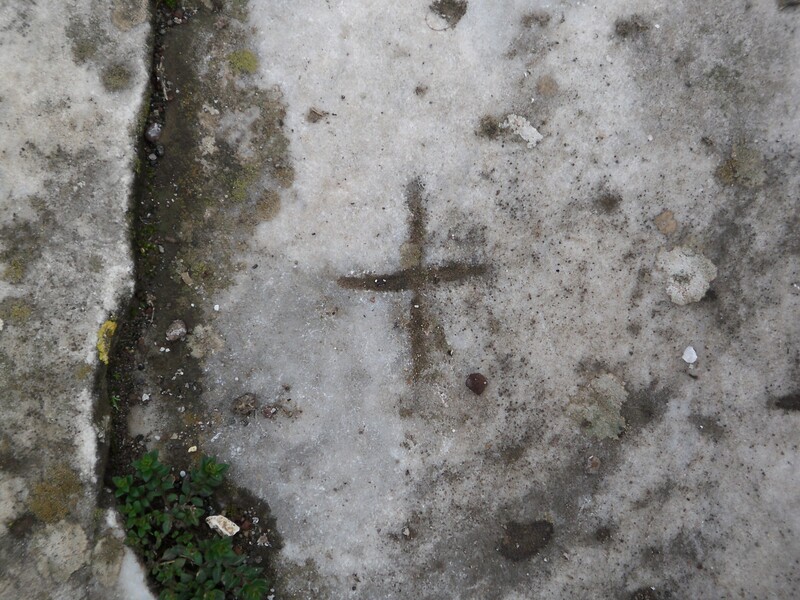 This phenomenon could mark areas of different craftsmen or different ‘rented areas’ for market stalls a. s. o. 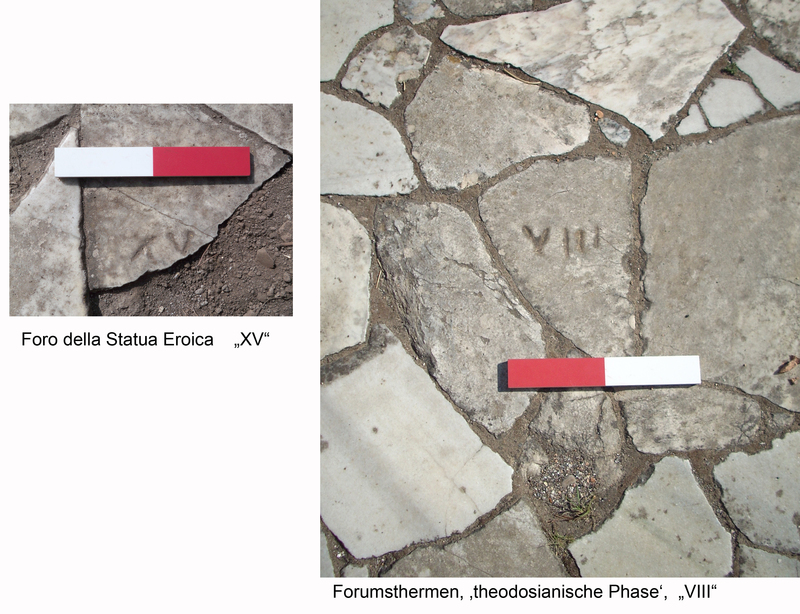 The same numbering was found inside the Forumsbaths, thus there are two possible explanations: either market-stalls can be excluded at least here inside a bath-building or the inscribed fragment in the picture below (showing XIII or VIII) was embedded only very late in the Bath’s pavement when this was restored in the 1930’ies with loose material from FSE. Some letters, N and O, mark two sides of a slab in the group of three monumental rooms, MFR. 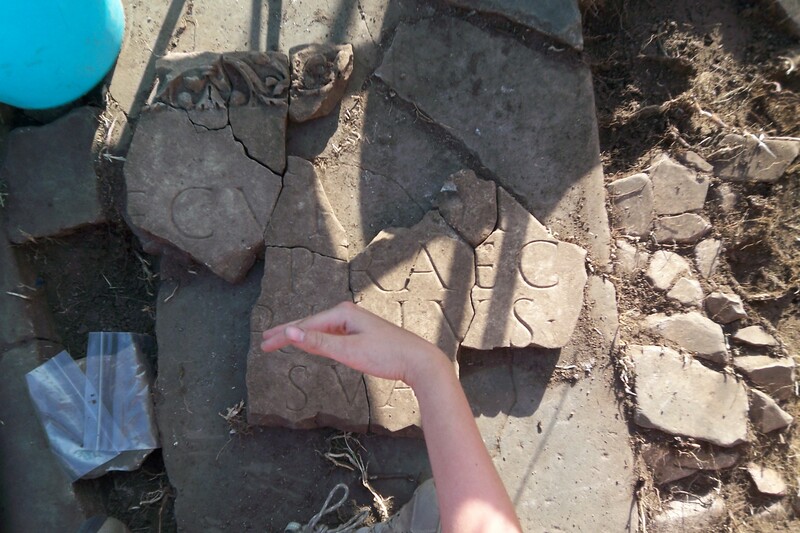 These letters were probably indications of the artisans how to (re-)construct the original monument. In the context of the later reuse of this monument in the pavement, the letters would be difficult to explain. 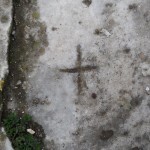 Last, but not least: Simple or more advanced crosses can be defined as christian symbols. Their dating is defined by the rise of christianity in the centuries from the fourth to the sixth. 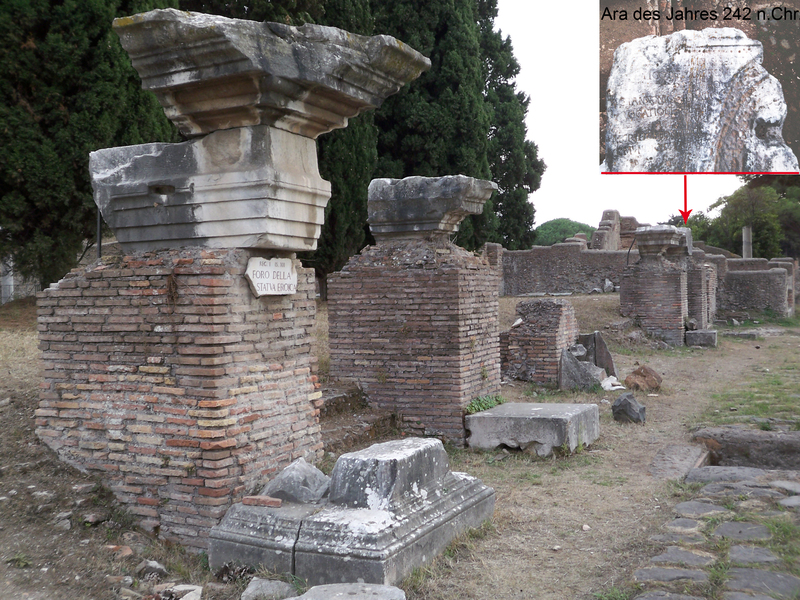 The example in the picture below can be found in the Forum plaza in front of the Capitolium. 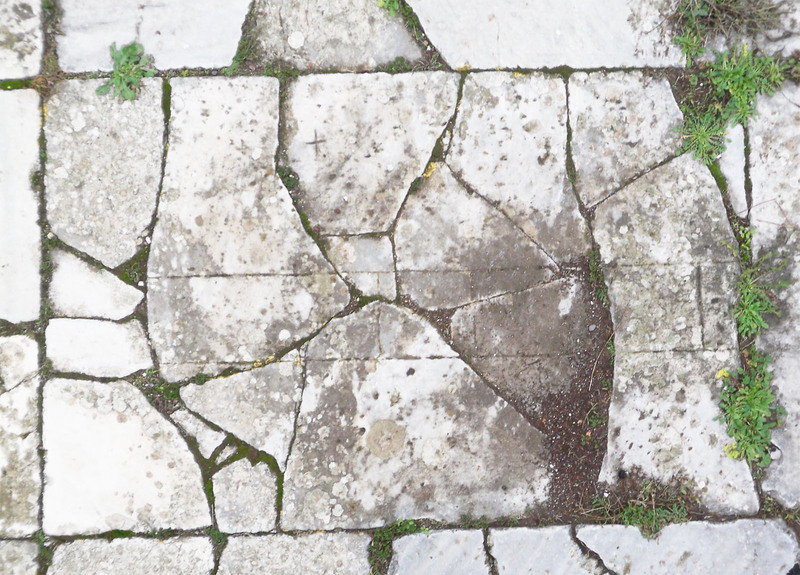 It belongs to the few originally preserved slabs which are embedded in a context of recently reconstructed slabs.